as some of you may recall, running a lot is great for dealing with depression. Back in the day, when I was a kid, I used to run a lot. Yet my gym instructor (wouldn’t quite call him coach) always commented on my terrible running technique, how I always step with my hill first and how unbalanced I was. Instead of trying, however, being the stubborn kid I was, I actually got pissed off. I figured that my supposed inability to run right was his fault as a teacher. When I blamed him he just called me an idiot, but a determined idiot I was nonetheless. I did some digging in, lots of it actually, and came to the profound conclusion that satisfied me – he was wrong, I was right, ha! As you can tell, I was pretty arrogant. So the first thing I did was to shove it in his face, in return, he gave me detention and I stopped trying. What does this have to do with anything? Well, as it turns out it wasn’t my fault that I wasn’t running right, it was all about the shoes. So I decided to pass this information onward. If you followed my advice about running then it’s only fair that you’ll get the full picture, yeah? Human feet are a beautiful marvel of nature, a biomechanical design built over a year of human evolution to suit our need to run, be it for hunting, running away or sheer mobility. So it struck me as odd when I was reviewing the modern shoe. See, their entire design goes against our natural build under the assumption that they help protect your feet. About half of all regular runners get injured each year, so what are these shoes actually protecting? lots of people that get injured simply change their shoes to what they think are “safer ones”. After all, a shoe with better cushions or some re-balancing should do the trick, no? Well, not quite – no changes in statistics were ever registered between different types of “modern” shoes. Don’t believe me? Let’s review research for a moment here. In one study with 81 participants they were given shoes with different levels of stability, and over 13 weeks no changes in injury levels were registered. A very similar study dealt with shoe soles and levels of cushioning, leading to no particular results after 5 months. These studies imply that the problems are hereditary by nature, having nothing to do with one design over another, the fact that they mess up with the natural build of your feet was enough apparently. You see, when you run with normal shoes you slowly become accustomed to running in a certain way, they put pressure on a specific part of your feet, causing you to move in an unnatural way. With modern day shoes you land on your heels whenever you take a step, instead of your forefoot. Not only is this type of running slower, since you are basically slowing yourself each step, but it’s also dangerous. You really should be landing on your forefoot. By landing on your heel you are putting a lot of pressure on your knees, hips, and lower back, essentially laying the groundwork for chronic pains on your knees and back the future. I know that’s what some of you may be thinking, and you are right too! As bad modern shoes are, they are still protecting you from multiple health hazards – they are providing support to your ankle and protect you from modern-day hazards, like broken glasses, or just random rocks along the road. I used to run a lot on the beach barefooted, and there were these annoying seashells in one part of my course. Stepping on them hurt. A lot. So yeah, you can’t just ditch shoes and run with nothing on. If you do that then you might step on a broken piece of glass and bleed all over – and let me tell you this right now, I won’t be taking responsibility. Right, So what should you do? That’s where the Xero Shoes come in! You see, Xero Shoes are barefoot shoes specifically designed to support your foot without all of that needless, useless, modern-day fluff. They balance your ankles and their soles are great at absorbing impact and protecting you from modern-day hazards. While originally using strings, modern-day Xero Shoes use straps instead for maximum levels of balancing and support, allowing you to choose your preferred type of sole beforehand (4mm or 6mm). In other words, they offer all of the benefits with none of the shortcomings, it’s not a perfect product by any means, no product is, and it does take a while to get used to, but the experience as a whole is worth it. Be it walking, running or hiking, the Xero shoes got you covered! These are great for kids as well, as they allow their feet to actually develop properly without being hindered by modern cushioning and design. If you got a kid, you might want to consider these (even more). In my attempt to rehabilitate my broken legs (figuratively), I looked into the Xero Shoes very recently and decided to get the Umara Z-Trail shoes, and the results were immediate. Among the shoes that I reviewed, these proved to be the best. The Umara Z-trailers are triple-layered shoes consisting of a foam layer (super comfy), another foam layer (thicker, absorbs impacts) and a rubber sole meant to protect you from random glasses and the like. While they aren’t quite as flexible as comparable models, they offer greater balancing and durability. Did I mention durability? Because these shoes right here can’t be worn down. I mean it, the company gives you a warranty with your purchase, stating that if you somehow wear these suckers down in less than 5,000 miles they will replace them for you for a nominal fee. I did not stutter there, a 5,000 miles warranty, who else will offer you something like this? You could run a freaking marathon in these things every day for half a year and then get them replaced for practically nothing. The specific design in my shoes is a huge, I actually lend them to a friend of mine who’s a runner, and over the past 7 months or so he wasn’t able to do anything to them. Through a combination of careful design, high-quality materials, and extreme flexibility these shoes were built to stay. If you are looking for a pair of shoes, drop your Nike or Adidas, the fact that they are expensive isn’t going to change the fact that they are ruining your health. That, and the fact that they are simply not durable makes them into terrible running shoes, and the price tag alongside them doesn’t make it any better. 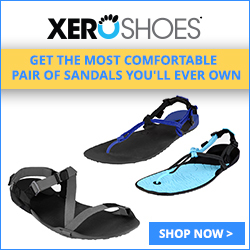 So instead of buying a branded and useless shoe, you should try one of these Xero Shoes. Sure, they aren’t the cheapest in the bunch, but they are safe, long-lasting and beneficial for your health. That’s actually a rare combination these days. Overall I would say that if you are interested in running or any other kind of endurance based sport you should definitely consider these, even for your day-to-day life, they really are that good. Wow, these look like great shoes! I’ve always favored walking barefoot or however close to that as I can get (not easy in wintertime). I train in martial arts and usually go barefoot, however just last session I’ve encountered horrible blisters on the soles of my feet and I’m looking for a solution to that. These shoes look like just what I need. However, I couldn’t open their homepage from the links you’ve left in the post 🙁 It’s probably something to do with their homepage, but I’d at least like to find out the price point. Their site does seem to be down at the moment, and that’s a shame too! A pair would cost you anywhere between 40-80 dollars a piece, keep in mind that a pair is going to last you for years to come, even through exercise!